Gradiant’s innovation in forensics technology to detect manipulation in multimedia documents showcases at 4 Years From Now (4YFN), the startups business platform at Mobile World Congress in Barcelona. From February 25th to 27th, Gradiant presents Valida at booth T3.1 (Spanish Pavilion, Montjuic Hall M8), a fully automatic forensic analysis technology to detect forgeries in digital documents. Nowadays, we live in an increasingly digital environment in which customers do not have to be physically present to open a bank account or take out insurance on their vehicle. While this scenario provides great advantages for customers and businesses such as easy shopping and customer growth, it also carries security problems like fraud or manipulations of documents and user verifications. This fact requires all companies with digital processes to implement advanced, reliable and easy-to-use solutions to prevent fraud, especially with digital on boarding and Know Your Costumers (KYC) processes. Valida’s main goal is to evaluate the authenticity of digital documents to prevent fraud in online user verification, digital on boarding and Know Your Customer (KYC) processes. This technology developed by Gradiant, in collaboration with atlanTTic research center of Universidade de Vigo, allows companies to offer an extra level of security in this operations, as it automatically analyzes any type of identity document (and other PDF and JPEG files such as payroll, invoices, receipts, etc.) to detect possible spoofing attacks and forgeries in the data present in these files. Now, Valida arrives at the largest worldwide mobile technology event of the year. Gradiant is not attending MWC-4YFN for the first time. As Daniel González, director of the Multimodal Information department of Gradiant, explains “MWC-4YFN is the biggest technology event of the year and to be in Barcelona for the second year in a row confirms the value of our technologies and the Spanish R&D potential to be at high international innovation level”. “After many years working in the multimedia security field, we have developed -in collaboration with atlanTTic research center- a tool that allows us to automatically verify in a few seconds whether or not a document has been manipulated” stated González, who highlights “this is an important innovation in the current digital world, where companies carry out thousands of users and files verifications every day. Besides, it is not necessary to have the original document to detect modifications with Valida”. Valida is an effective solution for companies with document verification processes. This technology automatically detects forgeries produced in digital documents. 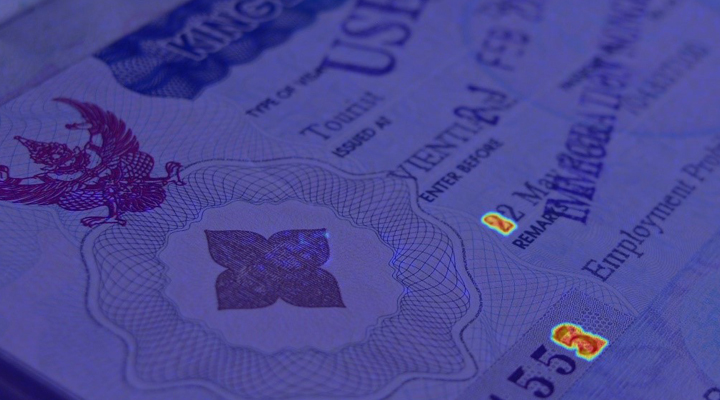 By using forensic AI-based techniques, our technology analyzes the document and show the manipulated areas, through a heat map that clearly indicates where the forgery has taken place. Valida supports all types of identity documents and nationalities: passports, identity documents, driving licences, etc. without specific adaptations. In addition, it does not require connection to external databases (e.g. identity document databases) to detect modifications and also warns if a document has been captured from a screen (and is therefore not a photo taken from original document). Remote and secure user identity verification has become a must-have for digital business. This fact makes it essential to develop advanced, reliable and easy-to-use solutions to prevent fraud, especially in digital onboarding and KYC processes. Fintech and insurtech companies with online processes already need mechanisms to authenticate and verify the thousands of documents they daily receive in digital processes. Valida allows companies to offer an extra level of security in such operations by analysing an ID document image or a payroll and detecting spoofing attacks just in a few seconds, thus combating fraud and avoiding losses. Gradiant has been developing for ten years technology related to the protection and identification of different types of files to provide multimedia security in different areas, such as the authenticity of printed documents with Signed or the traceability of printed documentation to identify the person responsible for the custody of a document in filtration cases, with Shadow.